Century Motorsport kicked off their 2014 British GT campaign at Oulton Park with their all new line up of reigning champion Rick Parfitt Jnr alongside GT debutant Tom Oliphant. 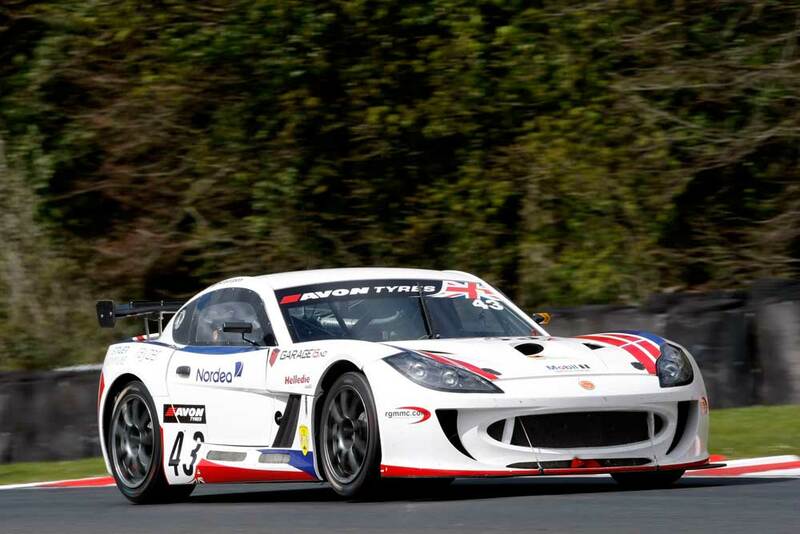 Also joining the team in their second Ginetta G55 was Norwegian Aleksander Schjerpen alongside Denmark’s Morten Dons. With the balance of performance adjustments applied in the run up to the weekend, pre-event testing was their first chance to test the cars with the adjustments applied. Parfitt and Oliphant came off best of the two cars finding a good balance which they carried into qualifying, Parfitt setting the second fastest time in qualifying one for the first race and Oliphant sixth fastest in qualifying two for the second race. The #43 Ginetta of Dons & Schjerpen were not so fortunate struggling with understeer issues in their car during both qualifying sessions. The pair qualified in seventh and tenth respectively for Monday’s two one-hour races. Bright skies greeted drivers at Oulton Park for race day on Monday. The morning’s ten minute warm up session provided both cars with an opportunity to ensure their setup was suited to the conditions. Particularly benefiting from the short run was Aleksander Schjerpen and Morten Dons. Having made some improvements to their car since qualifying, the pair identified they had made exactly the right call with a much more balanced Ginetta G55 GT4 for the race. Race one got under way with a strong opening few laps from both drivers. 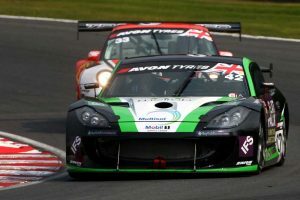 Maintaining their starting positions, Rick was keeping GT4 leader Ross Wylie under pressure and was ready to pounce for the lead at the earliest opportunity. Morten Dons was also sticking with the Lotus Evora looking for a way past into fifth. However approaching the pitstop window, Rick Parfitt Jnr in his IFS Ginetta G55 GT4 started to slow and pulled over on the run up to Clay Hill. With Rick’s car just off the racing line, the Safety car had to be deployed to recover the stricken Ginetta which was later identified to have been stopped by a fuel pump wiring issue. 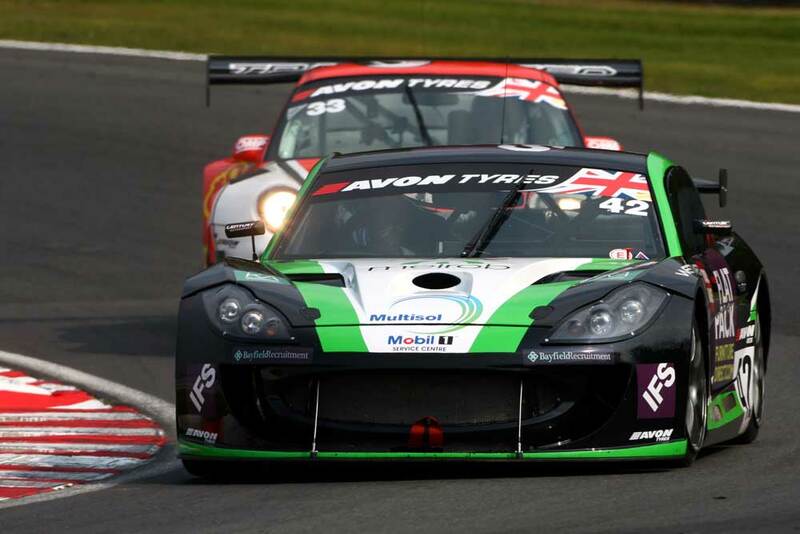 Opting to pit during the safety car period, Aleksander Schjerpen took over from Morten Dons for his first stint in the 2014 British GT Championship. Returning to the circuit in seventh, Aleksander was setting a very consistent pace throughout his stint. Benefitting from the ailing Matt Nicoll-Jones, Schjerpen in the Struer Kommune supported Ginetta moved into sixth position, which he would maintain for the duration of the race. With their car fully sorted after race one’s retirement, Multisol supported Tom Oliphant was in the car first starting from sixth position. Hoping to build on their race one pace, Aleksander Schjerpen was starting the race from tenth on the grid. A good start for both drivers once again allowed them to hold their positions during the opening laps. By lap six, Oliphant had now moved into fourth passing a struggling Matt Nicoll-Jones. However all was not well and Tom reported that he was struggling with the balance of the car on the heavy fuel load. Coming into Old Hall corner, Oliphant ran marginally wide and ended up in the barrier. Despite walking away from the incident, the safety car had to be deployed to move his car to a safe position which now played into the hands of Schjerpen in the teams second Ginetta. An instant call just as the safety car was deployed to pit followed by a rapid pitstop allowed Morten Dons to return to the circuit in the lead of GT4. By lap 14, the Safety car was now in and Morten was enjoying a healthy GT4 lead, which he controlled with ease. However more drama was to follow with yet another Safety car period to clear the stricken GT3 race leaders. Instantly wiping out what had been an almost 30 second lead, Dons did his upmost to remain in front when the race got back underway with just five laps to go. However he couldn’t keep the TF Sport Aston Martin behind him on the straights and he slipped back to second. However he would remain there until the flag and with it take the teams first podium of the 2014 season.